Natasha Romanoff was once a Russian spy trained in espionage and combat. After defecting from her Russian origins, she became an agent of S.H.I.E.L.D., fighting the forces of evil alongside the Avengers through whatever means necessary. Originally introduced in 1964, Black Widow was redesigned in 1970, debuting her now signature red hair and black suit. 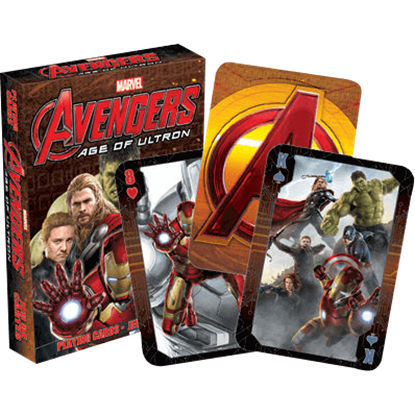 Here at Superheroes Direct, we offer a variety of Black Widow apparel and collectibles for fans of this mysterious heroine. Anyone looking to emulate her iconic appearance will find a variety of costumes and wigs to choose from for both adults and children. For those searching for a more casual way to show their devotion, we offer fashionable t-shirts emblazoned with the Black Widow symbol or graphics from the comics. Also available are Black Widow figures, perfect for any fan of this femme fatale. 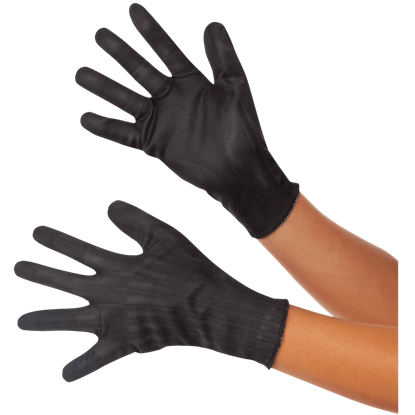 Ensure your heroic superspy outfit is complete down to each detail with the Adult Avengers 2 Black Widow Gloves. 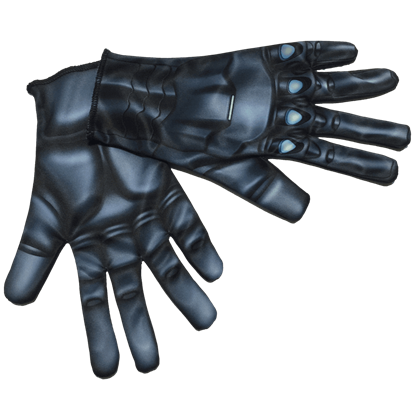 Inspired by Black Widows look from Avengers 2 Age of Ultron, these fabric gloves feature fantastic printed detail. You need not cut and dye your own hair to keep up with Black Widows often-changing hairstyles. Wear the Adult Avengers 2 Black Widow Wig next time you dress as this superspy to effortlessly achieve her short, curled bob hairstyle. If you cannot get enough of Natasha Romanoff after seeing Captain America The Winter Soldier, this costume makes a great way to relive the film! The Adult Black Widow Costume lets you dress as this master spy and heroine. Natasha Romanoff is a master of disguise. 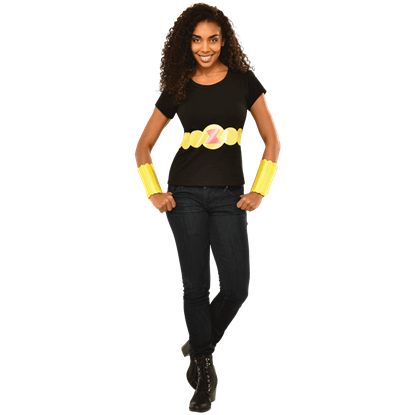 You will be ready for any mission when you wear this Adult Black Widow Costume Top and Gauntlets. Based on her classic look, this casual costume is great for Halloween or any costume event! Audiences got another taste of the former Russian spy Natasha Romanoff in the film, Captain America The Winter Soldier. The Adult Black Widow Jumpsuit Costume allows you to dress as this fierce heroine this Halloween! Secret agent and master of disguise Natasha Romanoff is also known as Black Widow. As deadly as she is beautiful, Black Widow is one of the Avengers in Marvel comics. Now you can dress like her with these Adult Black Widow Leggings. Bohze moi! This Adult Black Widow Tank Dress is a sleek costume number that martial arts master Natasha Romanoff would appreciate for a night of club dancing or shopping and brunch with fellow Avenger Scarlet Witch and Agent 13. Originally an agent of the KGB, Natasha Romanoff defected to work with S.H.I.E.L.D. and the Avengers. Her code name is Black Widow and she is a master of disguise. Wear this Adult Black Widow Tutu Skirt as part of your agent ensemble. Operative Black Widow is a chameleon, constantly changing her appearance as she infiltrates enemy headquarters and gathers intel. 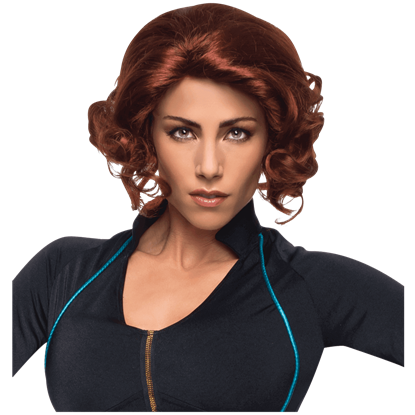 This long wavy Adult Black Widow wig displays the softer look she wore in Captain America: Civil War. 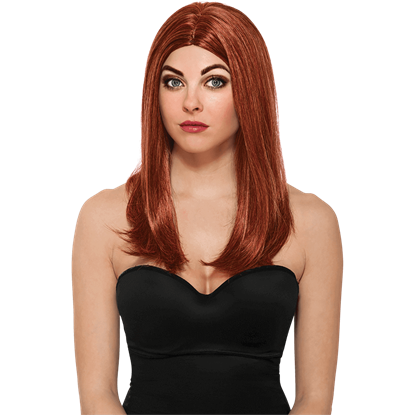 Complete your transformation into the heroine Black Widow with the addition of this wig to your ensemble! The Adult Black Widow Winter Soldier Wig mimics the hair style of Natasha Romanoff in the second Captain America film.